The ability to read the weather is a valuable skill practiced by our ancestors that has gotten lost throughout the generations. It is convenient to tune in to the local news and hope this is one of the times the meteorologist will be right. But anyone who hangs their laundry out on the line to dry realizes that the weather forecast is wrong just as often as it is right. There are many ways to determine whether or not rain is coming, but the first skill to learn is cloud identification. There are nine cloud formations that, with practice, become easy to identify. Recognizing clouds and what they mean is the most reliable way to determine what the weather will be each day. Cirrocumulus clouds look like the ripples you find on the surface of a lake. You can feel confident that you will have good weather when these clouds are in the sky. Altocumulus clouds are also fair weather clouds, although they usually form after a storm. Cumulus clouds are the large, white, fluffy clouds that look like giant cotton balls. If they are largely separated they indicate good weather. If they are tightly packed they are capable of producing heavy showers. Cirrus clouds are found at high altitude. They have a wispy appearance and are seen in good weather. Cirrostratus clouds are made from ice particles. This is what sometimes causes the appearance of a halo around the sun. If a sky full of cirrus clouds darkens and turns to cirrostratus, you can expect to get rain or snow, depending on the temperature. Nimbostratus clouds are another type of cloud that denotes several hours of rain or snow. Nimbostratus clouds form low blankets of cloud coverage. Altostratus clouds will form a greyish veil over the sun or the moon. They often, but not always, predict rain. Stratocumulus clouds are another possible indication of light rain. These clouds form a lumpy mass that covers the entire sky. 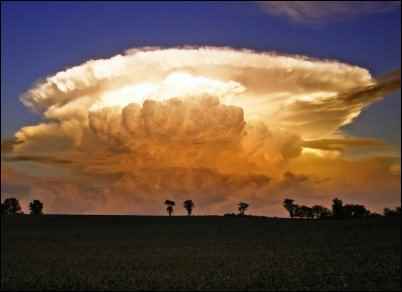 If you combine what you know about cloud formations with other natural signs, you will be very adept at “guessing” what the weather will be like each day. Some of the natural signs for reading the weather may seem silly to our educated generation, but if you give it a try you will be surprised at how accurate they are. Smell the flowers; the aromas of your fragrant, outdoor flowers will be more noticeable. Scents are stronger in the moist air that comes before rain. Look for a solar or lunar corona—the milky halo that appears around the sun or the moon are caused by water vapor. It often means moisture is moving much closer to Earth. A bad hair day can be caused by the weather. If your normally curly hair begins to droop and straighten, it is probably a result of a rising humidity level which often means rain is on the way. Watch your cows. Cows prefer to lie down when rain is imminent, and they will stand facing away from the oncoming wind. Grow scarlet pimpernel. 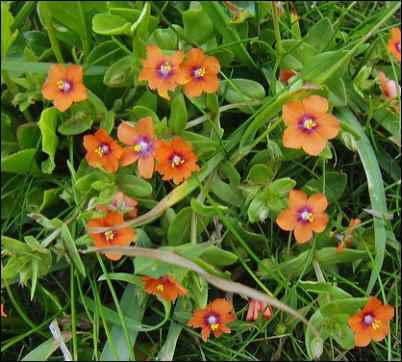 Scarlet pimpernel is commonly referred to as the Poor Man’s Barometer because its flowers will close when the atmospheric pressure decreases, predicting rain. Ask your bees. Bees do not like getting wet and they have a hard time flying in strong winds. When your bees swarm back to their hives, you may be getting a thunderstorm. If you are close to the beach and you notice seagulls gathering on the sand, be prepared for a storm. These birds normally love landing on water but they will avoid rough seas. A red sunrise denotes a low-pressure system that is pushing moisture towards you. If you notice hungrier than usual squirrels and birds, there is a good chance you are going to get a big storm. Herd animals such as cows, deer, and horses will group together and face the same direction when a storm is close. One great thing about an oncoming storm is that the fishing will be great! Fish are very sensitive to changes in pressure and they will feed heavily before a storm so they can return to deeper waters and wait out a storm. If you notice that birds are migrating early, get ready for an early winter. The black and brown Tiger Moth caterpillar, commonly known as the woolly worm, can help you predict how bad the winter is going to be with his middle brown stripe. The narrower this brown stripe, the harsher winter will be. Research has proven the woolly caterpillar is right approximately 80% of the time. Plants will adapt before the harsh winter arrives. Corn husks, onion skins, and acorn shells will be thicker. Evergreens will produce more and larger pine cones to help give their offspring a better chance of surviving a tough winter. You should plan for a potential drought if you notice a drop in the fertility rate of your cows. Becoming a student of phenology is another way to predict and plan for the weather. Phenology comes from the Greek for the “science of appearances.” It is the study of the seasonal timing of natural life cycle events and activities. Scientists study phenological events to help them study the effects of climate change on food production and the success or failure of plant and animal populations. Regardless of where you stand on the climate-change debate, it is easy to see that many spring events are happening earlier and many fall events are occurring later than they did in the past. Phenology not only helps scientists in their quest to learn about the climate; this information has been used in gardening for thousands of years. We can use it to help us make connections between the natural world and our own food production. We need to know the proper time to plant to avoid frosts. Knowing the natural stages of plant and insect development is also very helpful to farmers and gardeners. We are all used to consulting a calendar or the USDA Hardiness Zone Map when we are ready to get our garden going. These are generally good references but they are completely isolated from the natural world around us. If we learn to use the signs of nature to help us with our food production plans, we will be much more successful and produce more because we are working with nature instead of against it. Being a student of phenology is not a one-time project. It takes years to notice the signs of the seasons and how they are changing or staying the same. The best way to do this is to keep a phenology journal where you record the signs you are seeing in your immediate area. You can record the date specific plants flower, when a tree’s leaves emerge, the date an insect hatches, or when you first notice a migratory bird that commonly feeds in your yard. The dates these events occur are affected by conditions such as the length of the day, temperatures, and rainfall. Those are other notes you can make in your journal. It is easy to make your own rainfall meter with a coffee can and a ruler, and it is simple to stick an outdoor thermometer in an accessible place for daily reading. It will take a few years before you can compare months and notice any trends but you will be amazed at the things going on in your yard that you start to notice when you are keeping a record. Changes happen relatively quickly but you don’t want to get data overload and burnout so I recommend going out in the field as a phenologist once a week. Gardening using phenology as a guide is fun and it also helps you notice things to record in your journal. There are seasonal signs that tell you when it is safe to plant certain crops. Luckily, by keeping your eye out for these signs, you won’t miss opportunities for other fun and useful homesteading activities. When the daffodils are in bloom it is a good time to plant half-hardy vegetables such as beets, Swiss chard, and carrots. 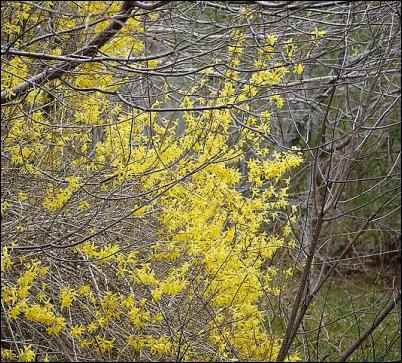 Watch for forsythia to bloom. When you notice the bright yellow branches it is time to plant your peas and it is the last chance you may get to plant cold weather lettuce. Do not plant potatoes until you see the dandelions in bloom. Before you plow up that weedy dandelion patch, pick them for some dandelion tea (see recipe below). When the quince is blooming you can transplant your cabbage and broccoli. This is usually a good time to dig up and divide your September lily bulbs. Once your yard is covered in the purple of wild violets, you can plant most anything in your spring garden. Although it seems like a lot of work, you can harvest all of those pretty purple flowers. Steep them in a jar of apple cider vinegar for up to six weeks. This vinegar makes a delicious peppery-flavored oil and vinegar salad dressing. Apple trees are a good indicator. When they first blossom it is time to plant your bush beans. When the apple blossoms fall, plant your pole beans and cucumbers. When the irises are blooming, get your peppers and eggplants in the garden. This is also a good time to dig and divide any daffodil or paperwhite bulbs. When the elderberry trees bloom, it is time to forage for wild mushrooms such as chanterelles. Elderberry flowers, steeped in wine, make a delicious cordial. Once the flowers fall, collect and clean the berries and make elderberry cough syrup. Lay the dandelions you have collected out on a large surface in a single layer. Let a fan blow over them until completely dry. Pick the flowers from the stem and store flowers in a glass jar with a tight fitting lid. To make dandelion tea, steep two tablespoons of the flower in eight ounces of hot, but not boiling, water for five minutes. Strain. Add sweetener and lemon. Dandelion tea is said to help manage diabetes and high blood pressure. Lay the elderberries out on a paper-lined tray for a few hours. This is to give the critters a chance to crawl away. Put the berries in a large plastic tub with a lid and cover with water. Let sit twenty-four hours. Pour the berries and the water in a large pot. Bring to a slow boil over a medium flame. Add the cinnamon stick and the zest and juice of one lemon. Add sweetener to taste. Cook until the mixture reduces by half. Remove the cinnamon stick and strain out the berries, pressing with the back of a spoon to release all of the juices. Ladle into sterilized canning jars. Process in a boiling-water bath for ten minutes. Let sit on a folded towel for twelve hours before labeling. Store in a cool, dark place for up to one year. When you are treating a dry cough or a sore throat, fill a shot glass with the syrup and drink. The taste is pleasant, it will relieve a cough and numb your throat. Have fun this year in your garden or on your farm by donning a scientist’s hat. The connections you make and the phenomena you observe will help you take better care of your land and the life on it, as well as make you a better, more efficient gardener. I wish I was a little younger; I’d go into this “whole hog.” I have watched the seasons and thought I was doing things by instinct but maybe it’s more that my subconscious recognizes patterns from the past!